Home » LibraryReads » PRECIOUS THING is on the March 2014 LibraryReads list! 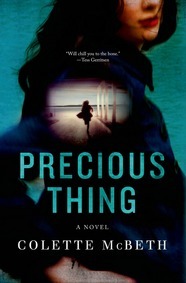 PRECIOUS THING is on the March 2014 LibraryReads list! FABULOUS NEWS! Colette McBeth's thrilling debut novel PRECIOUS THING is #8 on the March 2014 LibraryReads list! I know her inside out. I know what she’s thinking, I know what she wants. So I can’t give up on her, she knows I never will. Imagine discovering something about your oldest friend that forces you to question everything you’ve shared together—so goes the story between Rachel and Clara. They met in high school when Rachel was the shy, awkward new girl and Clara was the friend everyone wanted. Instantly, they fell under one another’s spell and promised their friendship would last forever. Flash forward to present day: now in their late twenties, Rachel's the one who has it all—the plum job as a television crime reporter, the apartment and the boyfriend; meanwhile, Clara’s life is spiraling further out of control. Then Rachel’s news editor assigns her to cover a police press conference, and when she arrives, she's shocked to learn that the subject is Clara, reported missing. Is it abduction, suicide or something else altogether? Booklist gave PRECIOUS THING a starred review saying, "Debut author McBeth’s GONE GIRL-style psychological thriller will be a widespread hit for fans of dark drama with questionable narrators, including S. J. Watson’s BEFORE I GO TO SLEEP (2011), Sabine Durrant’s UNDER YOUR SKIN (2013), and Karen Perry’s THE INNOCENT SLEEP (2013)." See the complete March list at LibraryReads.org. Thank you to everyone who voted! Keep in mind that February is a short month so nominations for the April list will be here soon (due March 1). Need help finding books? Check out our Edelweiss collection of April 2014 titles. Don't wait, nominate! As for the current list, you can help support these great books by promoting each month's selections in a featured display in your library and by using the FREE downloadable marketing materials provided by LibraryReads, which includes flyers and online banner ads. Not sure what we're talking about? LibraryReads is a new program which harnesses the value of "library staff picks" into a single nation-wide discovery tool, a monthly list of ten newly released must-reads. To learn more about how to participate in LibraryReads (and get FREE e-galleys), click here to read our FAQ.